The superior design of the Next Generation Gator® tools includes real-time communication technology, improved ergonomics focused on optimizing the tool’s center of gravity and more power with an enhanced Makita® battery platform. 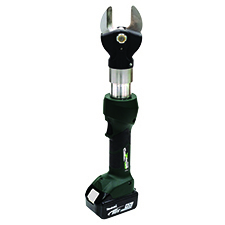 Tools in the new Next Generation line include 6, 12, 15-ton crimping tools, remote heads, dies, cable cutters, bolt cutters, and a 10K PSI Pump. Each product in this new Next Generation tool line features Bluetooth® communication. This allows operators to wirelessly manage their tools, access tool history, monitor service timelines, and customize tool operation to suit their preference. Another key innovative feature includes Intelli-CRIMP™ Technology, a unique pressure sensor that detects crimping force. Tools equipped with this feature emit audible and visual alerts when a crimp is below specifications. Greenlee’s Next Generation tools offer tracking and robust reporting capabilities to help streamline a company’s tool management, improve on costs and maximize a work crew's performance. The Gator Eye®App. actively monitors and provides a variety of alerts, reports, and tool information with its Bluetooth® capability. The improved ergonomics of the Next Generation tools includes a reverse tapered hand grip for increased grip strength and optimal hand positioning to help avoid user fatigue. The enhanced tool design also features an LED display that exhibits real-time communication of details associated with the tools including: battery charge level, pressure sensor readings, and cycle information. The rugged housing construction protects internal components against dirt and water intrusion. The new Next Generation tools also come with an upgraded high capacity Makita® battery platform with an active battery monitoring system for longer lasting productivity.